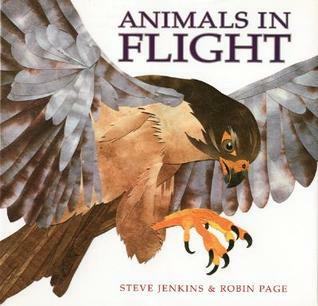 A few non-fiction picture books about birds educated and amazed us. Just the right balance of crisp text and brilliant illustrations made these books wonderful to read aloud. The stark cut paper illustrations, meticulous attention to detail, simple and direct kid-friendly text packed with information are what set apart Steve Jenkins' books. This one is no exception. We learn that insects were the first animals to fly, even before the dinosaurs. Why did animals have this adaptation - the ability to fly? The most obvious answer is survival - to escape predators and go in search of new food sources. Along the way we learn about birds and insects, and of course the only flying mammal - the bat. We also learn about gliders like Flying Squirrel, Flying Frog, Flying Fish, Flying Lizard, even Flying Snake. The book ends with a glimpse into human endeavors for taking to the air. As always, back of the book has a Notes section which provides more information about the animals. We have enjoyed many of Sills' books. The husband and wife team have written many books in the About... Series, of which we sampled About Birds and About Raptors for the bird study, besides the About Hummingbirds book. Each plate has gorgeous detailed illustrations of almost photographic clarity by John Sill. Simply amazing. The text is easy for preschoolers to follow along - simple, straightforward and packed with interesting information about the hummingbirds. We learn that most hummingbirds cannot walk, their feet are used for perching. And that hummingbirds can be found in different habitats like desert, mountains, wetlands/grasslands, and forests. Each double-page spread has text on one side and a full page color illustration on the other. The caption clearly indicates the bird(s) we are looking at in each page. Afterword has further information about each of the plates in the book. Again, just about all the books by the Sills are amazing. This is one of the oft-read favorite of the 5 year old, especially because of crisp lyrical text and bright illustrations. Swooping birds, whooping birds, birds with puffy chests. Dancing birds, diving birds, birds with fluffy crests. Swooping bird - Great Horned Owl, whooping bird - Whooping Crane, puffy-crested bird - Victoria Crowned Pigeon. Each page has just one phrase showing one type of bird. Back of the book has more information on each bird along with the thumbnail image of the bird. Many birds, if not all, talk and sing a lot. Why do they do that and what are they saying/singing? Bird Talk shares some of the things birds say. Like, male songbirds sing in spring to get noticed, they are saying, "Pick Me!" We learn about some of the other bird behaviors and strategies that can be noisy. Like the male Sage grouse puffs up his feathers and make "loud popping noise by blowing up air sacs and rubbing their wings across." Palm Cockatoo is like a "one-man rock band" whistling and bobbing and drumming against a tree. There was a time when the majestic bald eagles were on the verge of extinction. Through dedicated efforts, they have made a comeback. This books shares the success story in a heart-warming and kid-friendly way. A little boy works to get a pair of bald eagles to adopt an egg and incubate it. Alaska, the eaglet, is born. Slowly but surely she learns to fly. At the end, a little boy tells his dad how he read all about the return of the eagles on the Internet and how a little boy helped. Turns out that little boy at the beginning of the book is the dad at the end. they are a lovely set of pictures of birds taken in very high resolution with white background. Wow! Awesome picks Sheela - will look out for them. Thanks, have always enjoyed your recos. Here's another birdie book we love - Birds, Birds and More Birds byMatt Cosgrove.